Any walk along any coast path should start with a ride on an impressively rickety bus accompanied by the slightly camp but uplifting tones of Ride of the Valkyries. 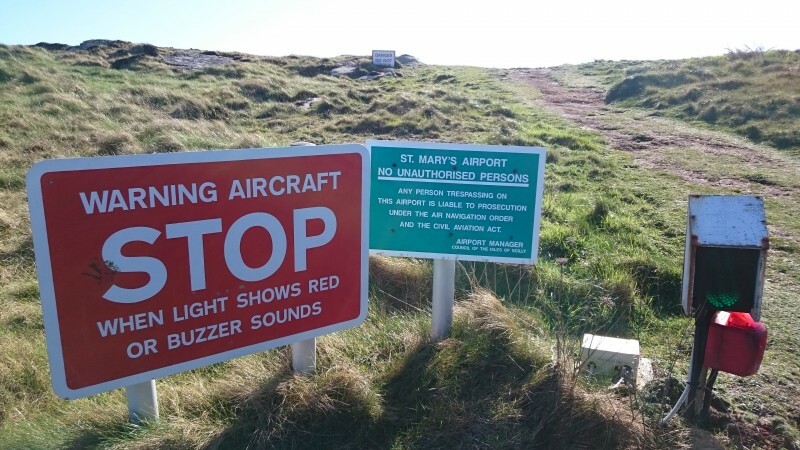 That it happened to us at the start of our first Walk Scilly walk on St Mary’s on the Isles of Scilly really shouldn’t have been a surprise. 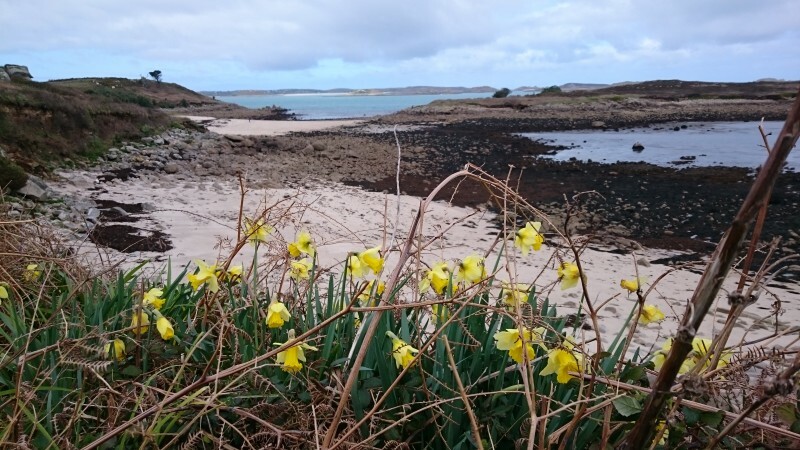 None of the Isles of Scilly coast paths are part of the South West Coast Path but should this situation change they would make a most excellent addition. 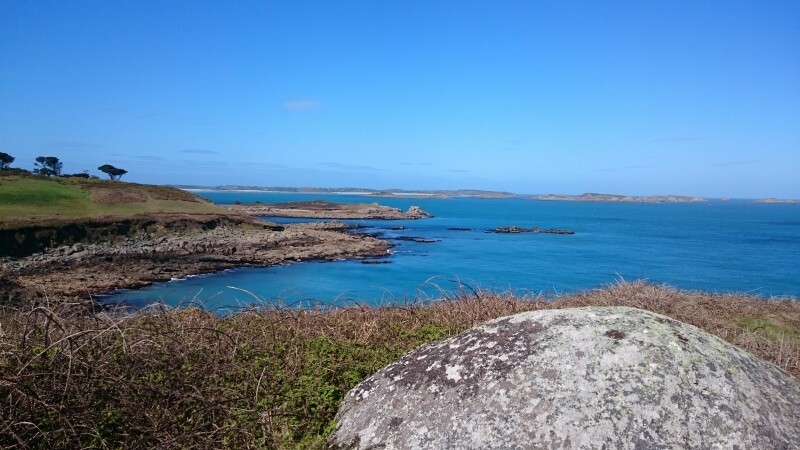 With 5 inhabited islands and 140 or more that provide a welcome habitat for wildlife, Scilly certainly isn’t short of coastline and when that coast is surrounded by turquoise waters, eccentric shaped rocks and pale sand it is coastline that makes for walking that is oxymoronically relaxing and stimulating. 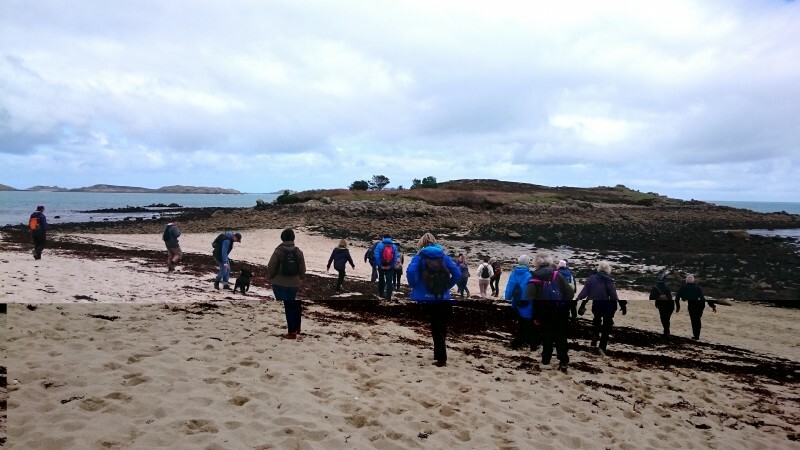 We started our walk with Dr Katharine Sawyer at Pelistry Bay on the East side of St Mary’s. Pelistry is a beautiful spot with plenty to explore, we walked across to Toll’s island (tidal) which packs in pre-historic, Civil War and post medieval remains in a coastline that can’t be more than a kilometre round. 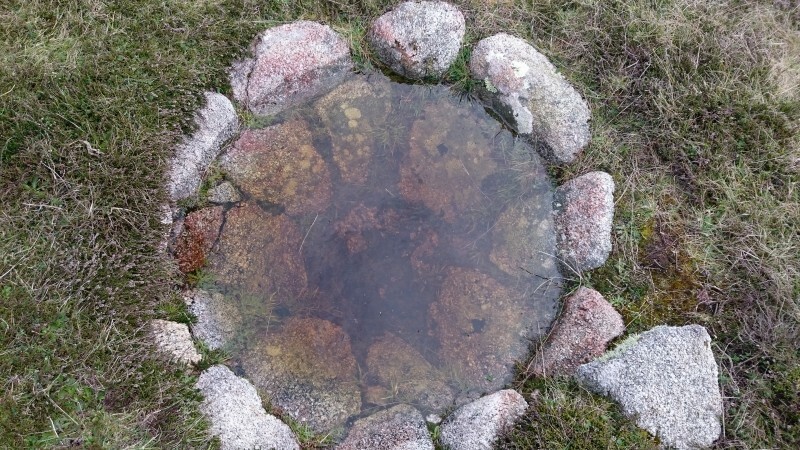 My favourite find here was the kelp pits where kelp was burnt to produce soda-ash for the production of glass (I wouldn’t have known what they were without Katharine’s expertise). After leaving Pelistry we headed south along a coast that really couldn’t fail to please. The cliffs were rugged, there was enough wind to whip up streams of white in the turquoise sea and inland the island itself was just beautiful. I couldn’t decide whether it was the scenery, the sunshine or the history that led to me enjoying this walk as much. The combination of the 3 however was just perfect. I even took great pleasure in having to cross the end of the island’s runway (aided by traffic lights) and would have loved to have stayed to watch a plane come in. As we wondered down back towards Hugh Town, we walked past the fascinating old harbour of Old Town, once St Mary’s main harbour. Again somewhere I would like to explore more closely with a beautiful church and fascinating graveyard. Despite its size St Mary’s is an island of contrasts but each contrast quickly moves into the next one. You can feel one moment as though you are out on wild moorland, the next on a sunny beach then before you know it you are back in Hugh Town with its bustling quay, wanting to walk round again so that you can take even more of it in. The nights might be drawing in, but autumn’s the perfect time to explore the wilder side of the Isles of Scilly at Walk Scilly Weekend. 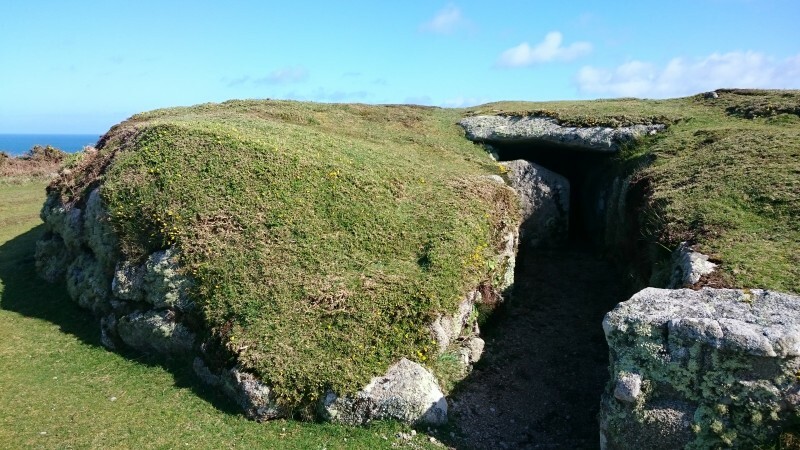 It’s a chance to experience the islands at their most magical and discover their wild beauty on a long weekend of themed, guided walks with experts who live and breathe Scilly. To discover more about the Isles of Scilly, go to visitislesofscilly.com. Fly to St. Mary’s with Skybus year round from Newquay and Land’s End Airports, and between March and October from Exeter Airport. Prices start from £140 return from Land’s End Airport. From spring through to late autumn, the Scillonian lll passenger ferry sails up to seven days a week between Penzance and St. Mary’s. Prices start from £90 return. To book your journey, visit islesofscilly-travel.co.uk or phone 01736 334220. 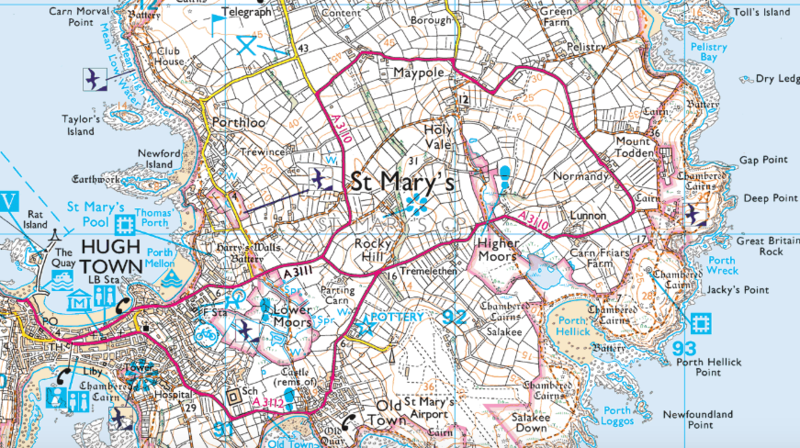 Accommodation: Mincarlo, St. Mary’s – mincarlo.info.